Farewell Blighty – Oi Brasil! These are the words of Luciana as she reminisced to me about her Porteno Grandparents and times when she’s felt homesick for Argentina. She lived in London for a time. I stayed with her for just shy of a week and felt so at home in this big old bohemian 1930’s apartment. Within 5 minutes of being in the door, with my backpack heavily lumped onto the cool floor we were ‘sharing a mate’. Another Couchsurf home. Luciana’s lived in a 1930’s residential building with gigantic proportions. =To take a mate (“ma-tay”). Much like black tea with milk in the UK – a.k.a. 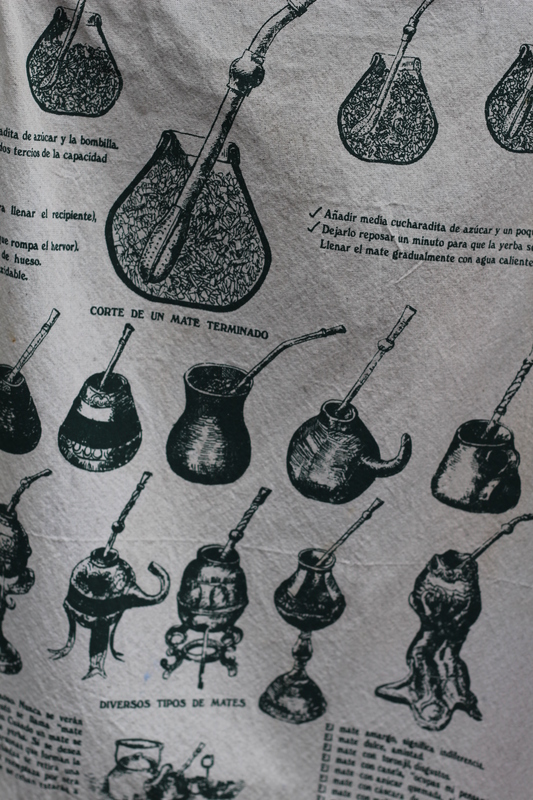 “a cuppa” – mate is ubiquitous in Argentine culture. Before the influence of American coffee shops took over the world, mate was even more embedded in daily life here. It’s not just a case of sipping this stimulating pick-me-up to revive yourself or to pausing for a thirst quencher – to “tomar un mate” is to share a conversation….to hang out….to be together. Loose leaf: add hot water to your mate and enjoy. 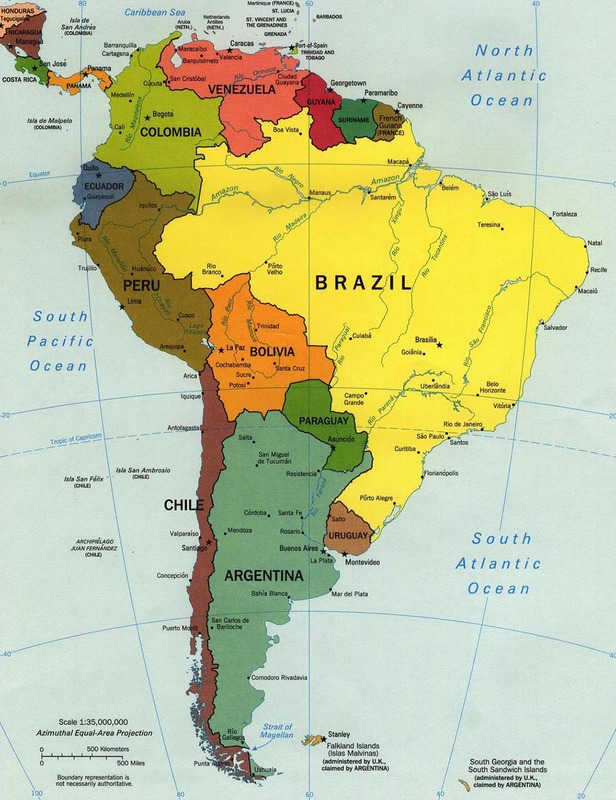 As you’d expected from Southern Brazil to Uruguay, from Northern Argentina to the South, mate varies in taste and preparation. I feel this way about tea in the UK. In my family a cuppa is drunk almost hourly (my father’s influence), much to the horror and puzzlement of our French relatives. To my delight, that cup of tea is nearly always accompanied by a chat, an update or a longer conversation. So the social contact and the drinking are interwoven. Mate is drunk from a little hollowed out gourd. These were as little as 20 pesos (about £1). 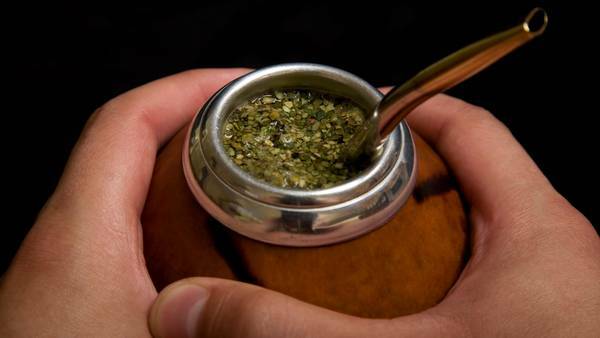 Mate is quite literally shared, the gourd and silver straw passed from one person to another. Not as tasty as the real thing: Empanada purses! Hotdogs! and other animal carcass things….plus chips: papa fritas. 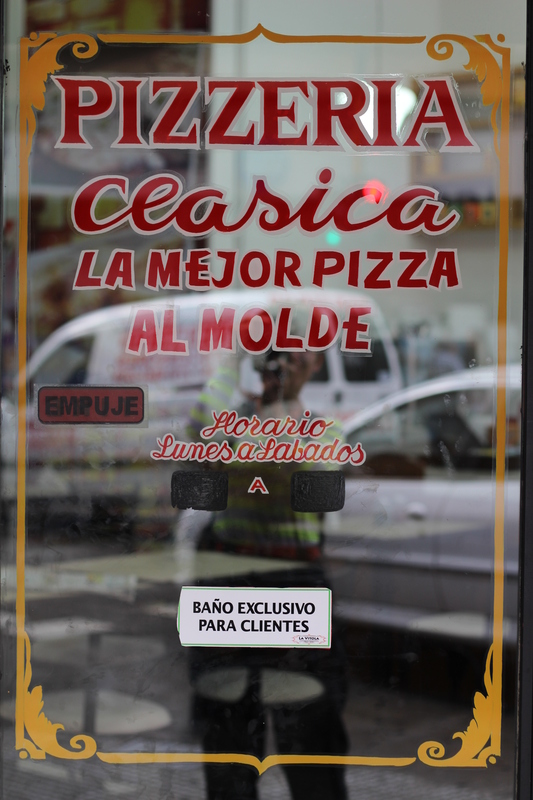 Bitza pizza everywhere – the ever-present Italian influence n Buenos Aires. Did I mention Dulce-di-leche…..? 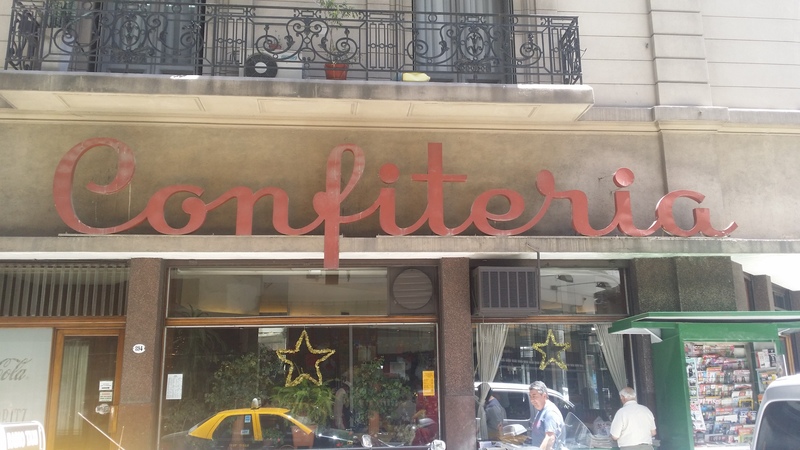 Confiterias everywhere, aaahhhhh! I have nightmares that Alfajores are chasing me down the street demanding I eat them! I’m so glad to catch this! It’s ‘CAPOS’ time! 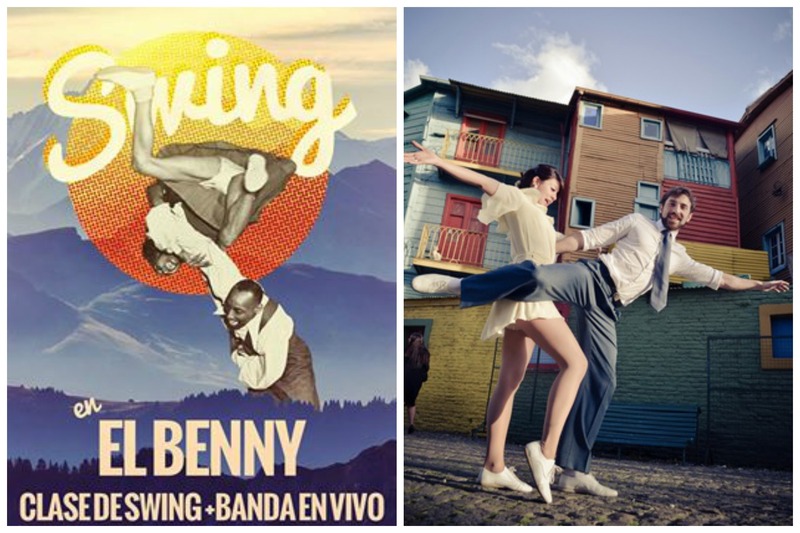 This is the Campeonato Porteno de Swing/ Buenos Aires Swing Dance Championships and the build up has been exciting with everyone seemingly rehearsing their socks off to refine their coreos/ choreographies. Dear Dario, another kindred Herrang spirit has been consumed with rehearsals and we’re yet to meet and share a mate. a ‘Portena’ government building graced with Jacaranda trees of violet blossom. I meet Elsie, a new pal, on a sun-drenched Saturday morning Avenida and we travel across the city to Pedro Goyena together. Elsie is from Bristol and we met at a Swing City dance class the week beforehand. She talks in the very best slang that is so familiar to me and her company is muy linda! Together we jabber enthusiastically ‘effing, jeffing as we go, flinging in healthy dollops of sarcasm and random metaphor. Yes, I’m learning Spanish but sometimes it’s nice to take time out and let off steam in your mother tongue. 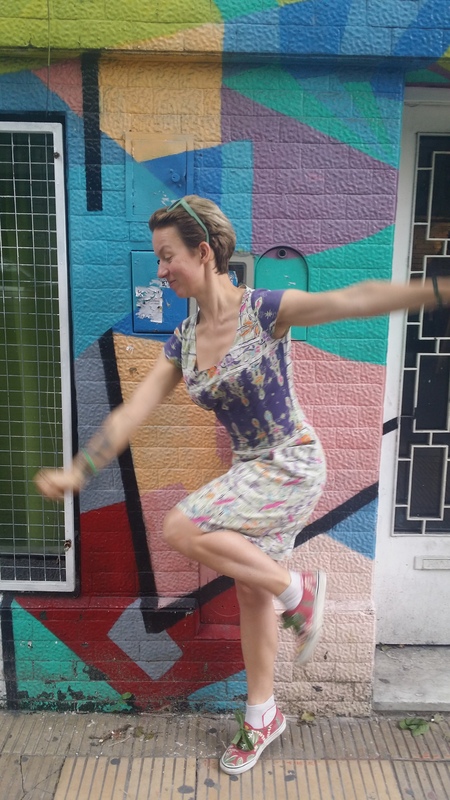 Elsie’s here in Argentina for six weeks to take stock, dip her plimsolls into Swing dance in Buenos Aires and to work with an alternative farming community in the countryside beyond the city. We arrive at a beautiful dance hall in a 1930’s building. Dancers are buzzing around with their contest numbers pinned to their clothes. As always in this scene there is the sweetest mix of ye olde 1920s-50s ‘vintage’ variation mixed with casual comfortable plimsols, t-shirt, jeans. Las Chicas line-up for the Open Jack & Jill. a J&J allows your ability as a dancer to be tested by dancing with a random mix of partners to music chosen by the Deejay, over a number of heats. This contest was Open to all abilities as opposed to an ‘Invitational’. Elsie enters the contest but I’m afraid I cower out. This Jack and Jill takes place over four sets with the best dancers selected from Round 1 to compete in subsequent rounds. With each heat, the number of dancers is whittled down to finalists. I get up and get busy during the 20 minute social dancing breaks in between the Jack & Jill. After some lovely dances I have a surprise reunion with Gabriela, Cinthia and Cesar – we met last year in Brazil. They’ve flown over to compete. Here they are in the Solo Charleston Finals. Elsie and I nip out for a much need break of fresh air, natural light, alfajores y café con crema. Upon our return, las coreos comienzan and we sit cross-legged to enjoy the fruits of the previous weeks’ laborious practise. I do love this!! Such humour, creativity and endeavour. This community is motivated and progressive. The energy here is in full flow. This is my favourite showcase! Rachel Austin y Alex Morgan mix it up and dance like ninjas: “increIBle”!! As the CAPOS continues into the night, my social batteries slowly wind down and I decide to forego the after party. 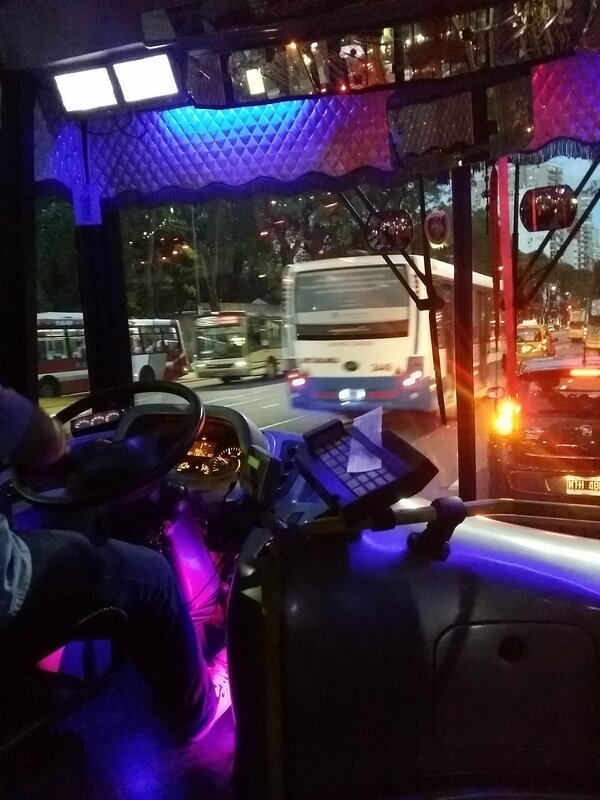 I catch the No.24 colectivo to Avenida San Juan where I’m staying with amazing Couchsurf host Luciana. Sweaty and in much need of a change of clothes I can’t even comprehend the after party despite Marcela’s encouragement, dressed as a 1920s flapper girl shouting across to Elsie y I on a busy bus at 1am. It’s Good to Be in Buenos Aires! I arrived here at sunset by ferry from Colonia, Uruguay. Our boat was welcomed by a sprouting of sky scrapers. Canary Wharf springs to mind, I feel a strange comfort. 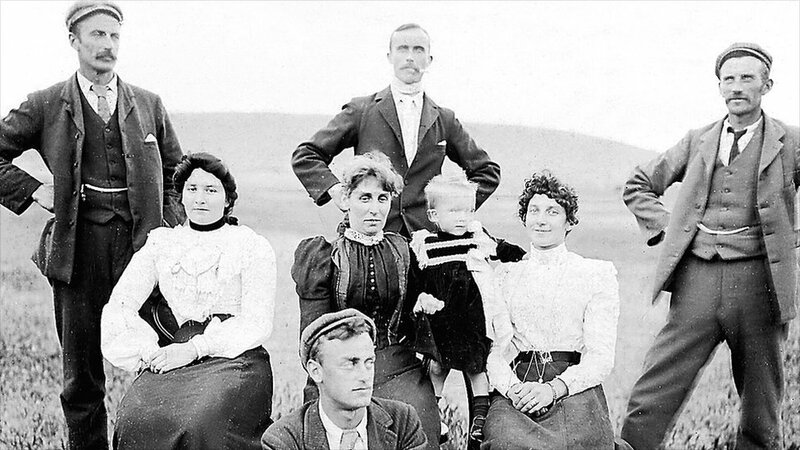 I imagine being an early immigrant arriving in this new land (before the skyscrapers) fleeing adversity and seeking some fortune. 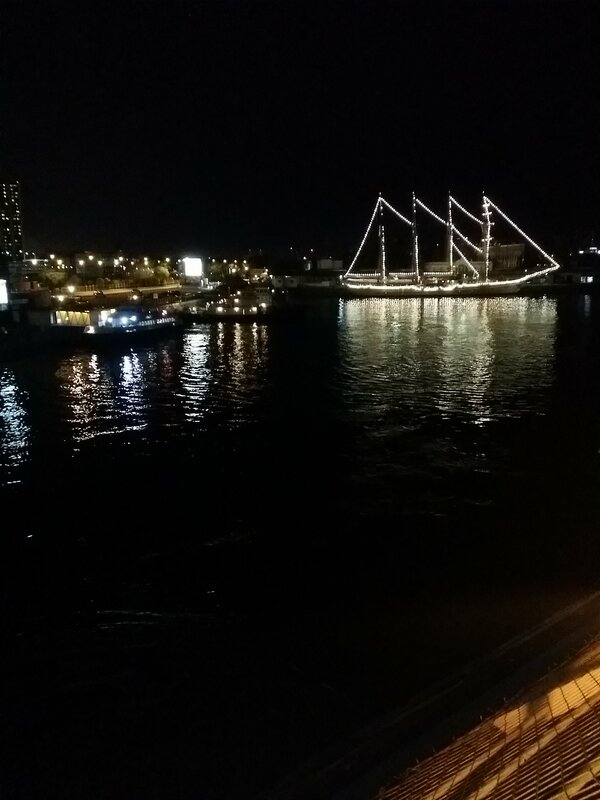 Puerto Madero y a small illuminated boat. 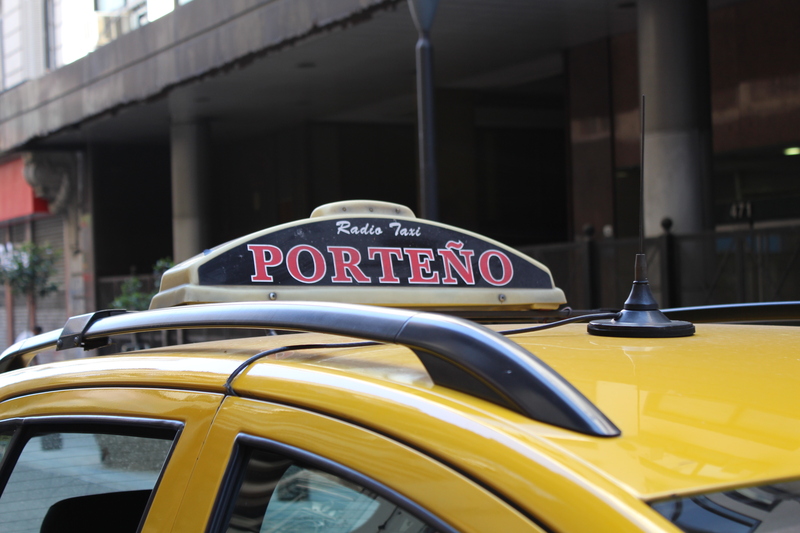 On emerging from Puerto Madero I haggle for a good taxi fare to Colegiales where Matti lives. We met through Capoeira in Salvador. I stay with him for my first few days and he helps me get organised with a Subte transport card + phone sim + phone apps to translate this matrix of calles /streets y colectivos /buses y barrios /neighbourhoods. Matti also introduces me to ‘Alfajores’….oh dear, my Achilles heel twerks: they’re like a ultra-uber-mega-souped up Wagon Wheel with a smother of dulce di leche in the middle. To update you: ‘dulce di leche’ is one of the pillars on which Argentine gastronomy is rooted 🙂 A condensed milk caramel, it’s ubiquitous here and heavenly to taste. Danger! I feel a distinct absence of culture shock being here in Buenos Aires. I keep reminding myself that I’m no longer in Europe but thousands of miles across an enormous expanse of ocean. According to the Portenos/ Buenos Airean locals, many profess Italian descent; the architecture here is a mixture of Italian, French and Spanish baroque as well as Art Nouveau and Deco. All in all the Euro-vibe starts to make sense. This is a Swing City! As always the local Swing dance scene is my faithful key, travel companion, my portal into a parallel experience. 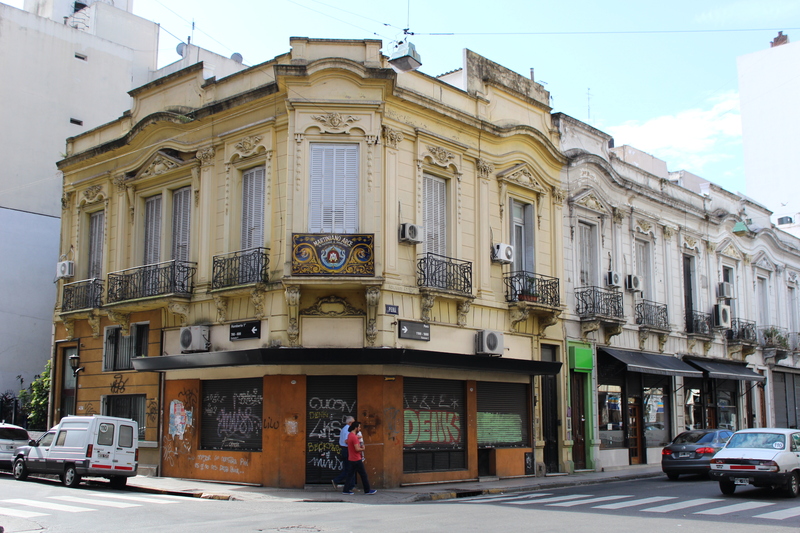 Buenos Aires is blessed with a bulging scene of daily classes and social dances. I am overjoyed and overwhelmed! Where does one triple step to first?! Celeste and I after her super class above a bookshop in San Telmo / A pilgrimage place for Swing dancers the world over: Herrang! Lovely Celeste meets me at a Big Band night in Belgrano, my first night on the town. She’s been non-stop all day with rehearsals for the forthcoming CAPOS (Campeonato Porteno de Swing/ Buenos Aires Swing Dance Championships). 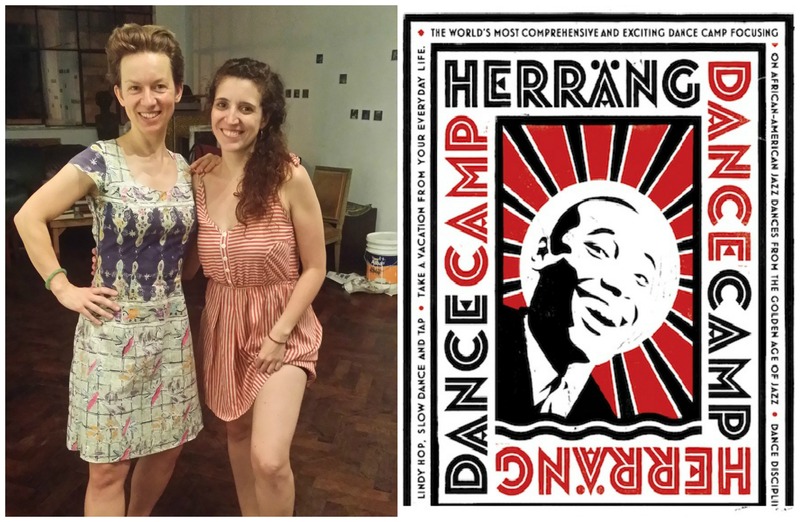 We met back in August in Sweden at the infamous Herrang Dance Camp. Thankfully, she advises which classes to take and introduces me to two Americans who have lived here in the big Latino Smoke for the past year, Heather and Blake. 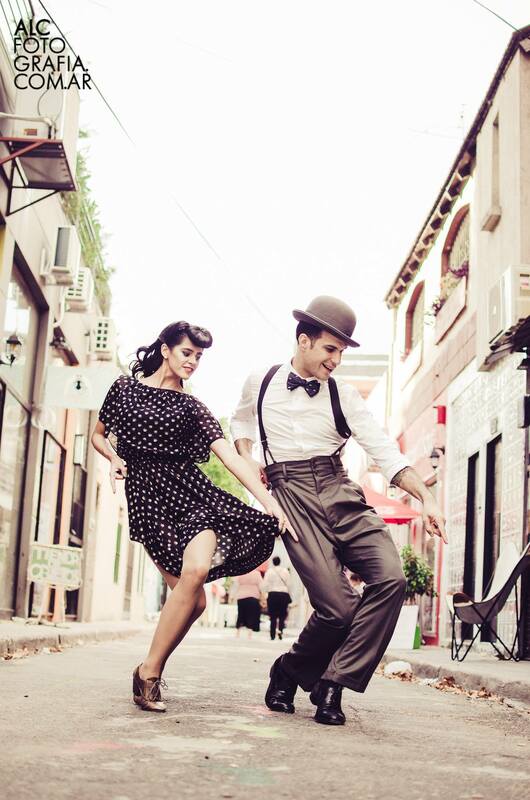 ‘Baila Swing’ con Lu Salinas y Jose Zarazaga. 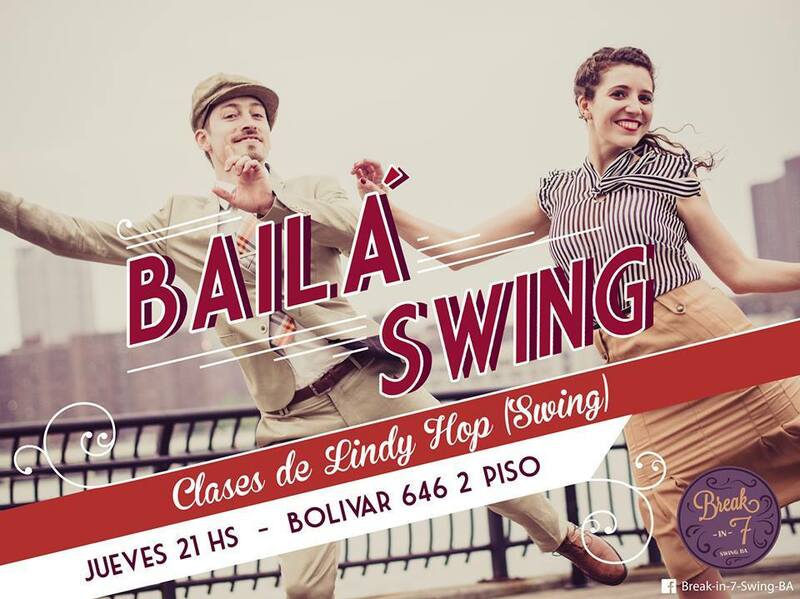 Swing San Telmo with Celeste y Mariano. I take the leap and enroll myself on one week of Spanish classes on Suipacha from Lunes/ Monday. I must learn the language here! no excuses. This is a valuable lesson learnt from never-quite-grasping Portuguese in Brasil to any level other than limited casual chat. Medialuna = ‘Half moon’. Croissant cafe bakeries are everywhere in Buenos Aires. After a couple of days of four-hour classes plus afternoon orientation tours, I’m tired but go along to Swing City dance classes nearby on Sarmiento. This is the Escuela de Baila Swing/ Swing dance school of jazz dance star Juan Villafane, Mariel Gastiarena y Manuel Bicain Goral. The mirrored studio is great, there are students a plenty, …..remarkably the Leads outnumber the Follows! and the class content is generous and challenging. !! HURRAH !! Candela Mendez y Juan Villafane. In pursuit of another journey to South America working and saving has taken over my life and I haven’t danced since July! What horror! Am I losing my way?! Despite a daily morning stretch routine and lots of walking my body feels like a concertina, compressed and stiff. Appropriate floating hands Addams Family concertina tinkering. Just when I begin to feel ever more disillusioned I meet Greta and she tells me all about ‘Scare Acting’ for a Halloween event called Primevil. “You’re paid to run around at night writhing, convulsing and springing out on the roaming audience. It’s very physical” she tells me. Physical is what I yearn for – I need no more convincing. A glimpse of Zone 64 at the start of our shift. Primevil takes place over 3 weeks in the middle of the Norfolk countryside. Groups of actors inhabit various themed spots in the woods and all are briefed to scare the living be-geezus out of the curious punters. I apply and go through auditions, casting and training in advance of the official opening. A fabulous professional scare actress by the name of Rosie leads us through physical theatre games during one training session. Through our bodies we morph from human to zombie to rabid animal to amoeba flinching on the floor. It’s brilliant fun! I’m assigned to Street Crew, a team who entertain those queueing up for the different attractions. It’s all improvisation, developing a character and seeing how he/she/it evolves through the night. This is wonderful! I’m being paid to explore street theatre with an open brief…few restrictions. Maintaining stamina during a 6 hour shift by: “bottomline: always staying in character” is taking me out of my comfort zone. Inspiration kicks in and I debut as Peach the Clown, a twerking ‘quirking’ hula hooping wanderer with a shrill voice. Feedback from those I pester is that I’m more funny than scary! Scaring doesn’t come naturally to me but Silly it would appear does. I partner up with ‘Cuddles’ my Clown sibling, or in real life: Kay, an air hostess. The following night I’m asked to dress as a Zombie. The management team have decided that Clowns are not sufficiently disturbing for queue scaring. I rummage through the dressing up boxes and emerge in a new incarnation: Bartholemew a lisping Cub Scout. Bartholemew’s character develops over the next few nights and I grow to love him. I sing arpeggios and encourage the queue to join in (Singing badge). I carry a rubber severed arm and squeak that this is the remaining body part of my mother (who I’ve eaten for my Butchery badge). I’m a demented Oliver Twist. I marvel at the bobbles of bobble hats and offer people ‘crisps’ in the form of dirty Autumn leaves. I do ‘expressive dance’ whilst spasming occasionally all in aid of earning my Dance badge. Again – visitor feedback is that I’m sweet rather than scary and some ask if they can take me home, ha! I’m delighted! As Primevil continues I work in other guises too: as an Undertaker…..a Cabaret singing Scarecrow along with Greta. We work from the ‘Forest of Fear’ leaping out from the trees ‘jump scaring’. I also adopt the angst of a doomed patient at zombie infested Zone 64 medical unit twitching and warning innocent visitors to “stay clooooooose”. All in all what better way to while away those October evenings (dancing in the conventional sense, aside)? My Primevil experience was invigorating and blew those cobwebs away. 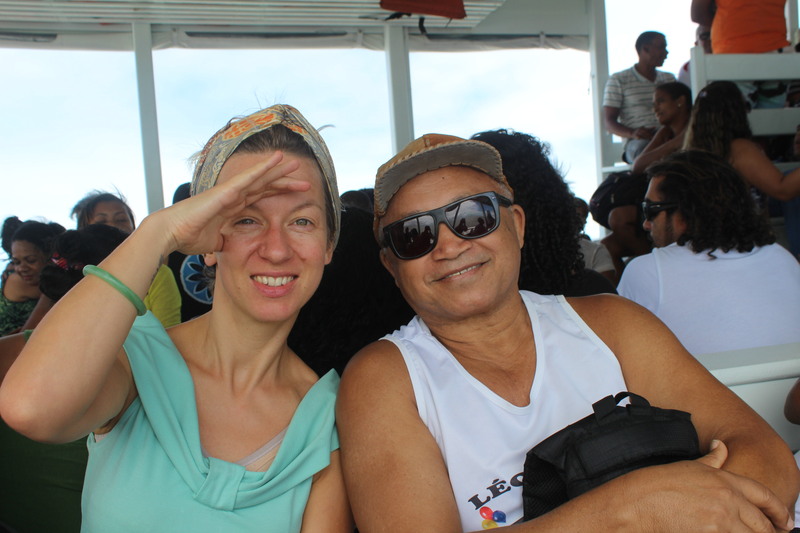 I became acquainted with some inspiring and hospitable visiting artists in residence on the island of Itaparica. Much to my extreme luck they invited me to join them at an all-night and very special Candomble ceremony. “Candomblé is an Afro-Brazilian religion. It was born of a people who were taken from their homes in Africa and transplanted to Brazil during the slave trade. 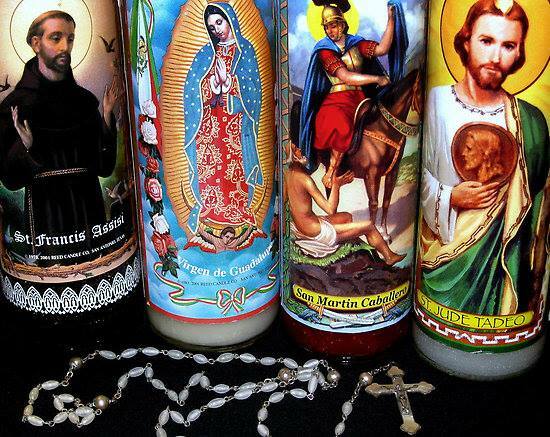 The religion is a mixture of traditional Yoruba, Fon and Bantu beliefs originating from different regions in Africa, and it has also absorbed some details from the Catholic faith over time. Today in Bahia, the heart of Afro-Brasilian culture, Candomble is practiced with great reverence, pride and even secrecy (to nurture away from the vampiric tendency of tourism). As an anthropology geek I felt enormously privileged to gain access to this occasion. 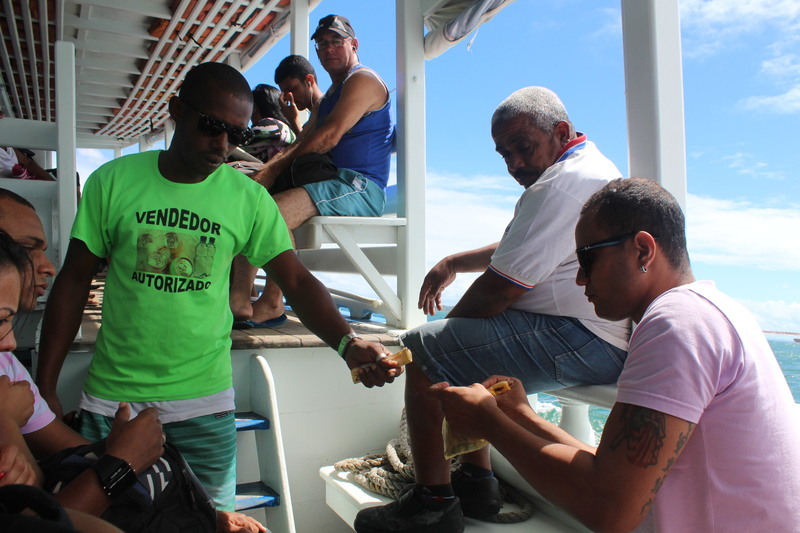 “I have an afternoon siesta and then take an evening boat to Itaparica. The journey is a joy. Early evening, cool breeze, a quiet boat with a few locals. I take this time to think and reflect. As we get closer to Itaparica I can the see the pretty church illuminated like a beacon. A boat bobbing in the water as my ferry arrives at Mar Grande; ‘Negao de Ogum’=’Denial of Ogum’. Wherever you wander on Itaparica you’ll notice Ile Aye references as this pretty island is the richest in Candomble heritage, preservation and practice. Ogum or Egun is the Orixa I was expecting to be in the company of that very night. I arrive on the island and take some time to soak up the busy life of the praca by the large old church. Families and children everywhere. I love the outdoor play and social mingling in this country. I sit down next to a voluptuous Mae and her little boy having a cuddle and wish I could join them in this affection. Food stalls, moto taxi, playground is buzzing. Lights, movement, dogs. I imagine the Christians, colonisers and even further back, the Indians and their impression of this place on first arriving. When did time begin here? I am yet another visitor, my feet padding on to the shore, a new arrival. One of billions over the course of time. I haggle and finally agree on a taxi ride to Instituto Sacatar – sleepy rural dirt track roads, such a different vibe here, horse in the street, red earth, a tropical version of where I grew up. Humility, peace, a natural place. We (Eun Jung, Guillermo, Cecile, Jon, Niki and Cristina) go to the meeting house together by VW Combi van. I arrive a little late and only just catch them in the dusk light. ‘Ile Aye’ = ‘House of Life’. It’s simple building with a corrugated iron roof surrounded by tall palm trees. As we approach the narrow dirt rack to the hall I see women in Bahian white headwrap, lace and cotton walking ahead; a sign that something’s afoot. I try to imagine for a moment the frame of mind of a local Camdomble follower in the lead up to a ceremony. I only have childhood Church to compare it with…feeling bored with a resigned sense of obligation. But this is a faith that has survived the test of time…displacement…cruelty. It’s a time capsule. A fundamental root. A family. I sense excitement! 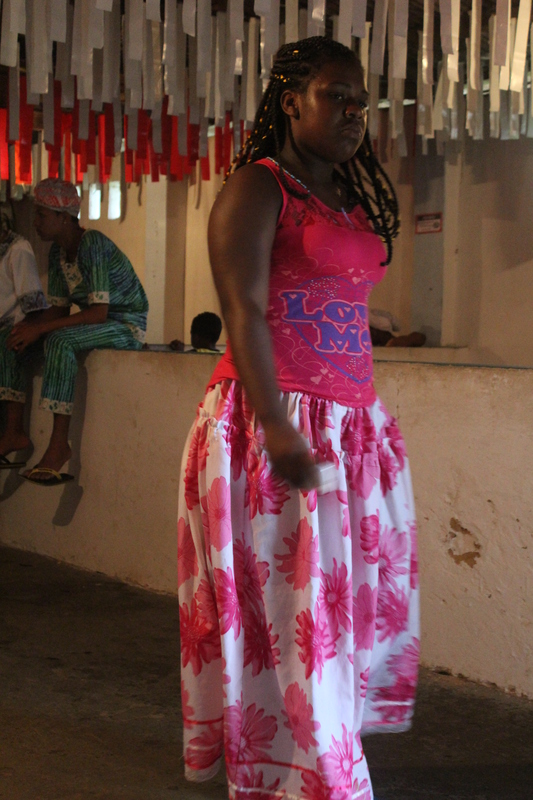 We go inside the hall full of local people in their Candomble best. 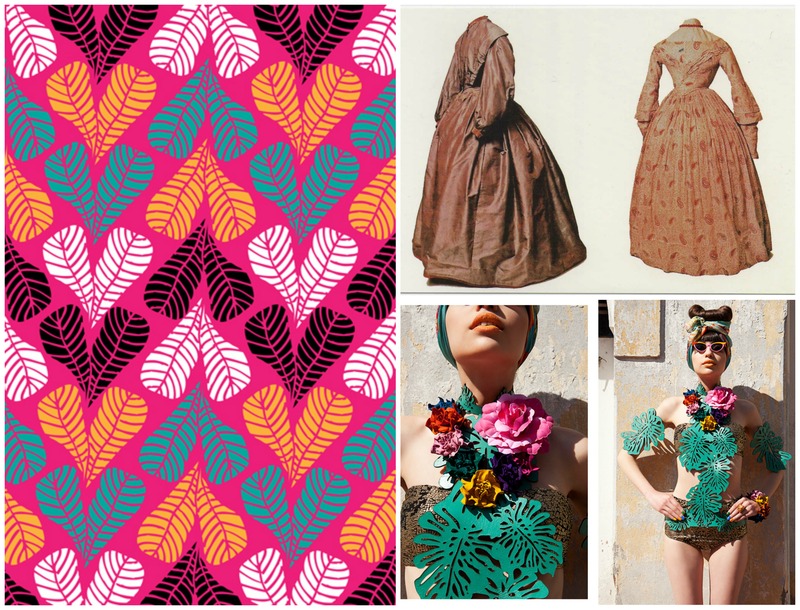 Women, men and children of all ages, amazing colourful clothes, arms and legs covered in respect, floral prints of every variation in lucious fabrics I feel I could be at a wedding. There’s a pleasant hub-bub. We are welcomed as guests and as women, given long skirts to wear. There are red axe shaped decorations and big palm branches on the walls…, ..lots of long red and white bunting hangs from the entire ceiling. We wander further up to find a place to sit and see the most wonderful axe shape of fresh green leaves there on the concrete floor. An altar? It’s about 3 metres square. The kitchen, just off the area of worship, is busy. As a second course of protection he guides us to wash our eyes three times from a small dish of water. He wears a bright red voluimous tunic + white floppy hat. He looks amazing. We admit a great sense of anticipation. Eun Jung notices a rooster in the corner bound and moving helplessly. Teenage boys practise drumming beforehand, warming up. Hip clothes – skinny jeans and baseball cap on top of their heads. In contrast to other men and young lads in regal traditional African garb. They are handsome and striking. Their drums wrapped in beautiful pink patterned fabric bows and of three different sizes. 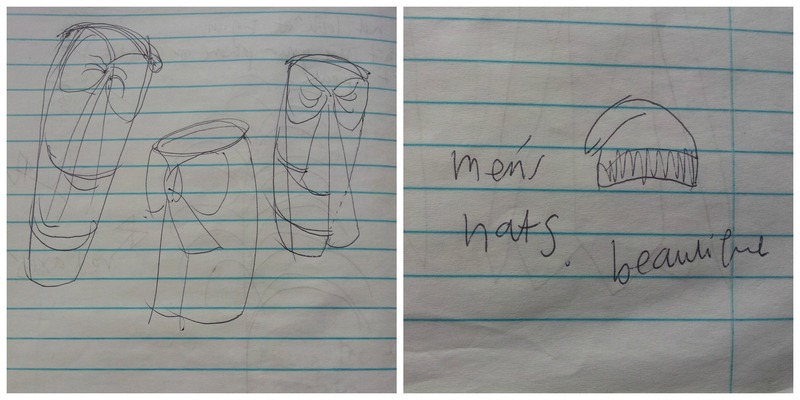 Scribblings from my raggedy notebook. Rightfully so, cameras and cell phones were forbidden but no one seemed to mind me making notes and the occasional drawing. And so Part One of the ceremony began. The door of the hall is locked to keep the spirits inside and everyone safe. The congregation is divided according to gender with men and women sitting in two separate camps. The priest sings and calls out. Different sequences of rhythms. The drums are very loud. Metal percussion instruments. A band of boys and men. As the singing and drumming begin a group of about thirty women get up and circle the axe of leaves. They sway, dance in simple symbolic movements and sing their hearts out. They sing and clap around the AXE. One of the dancers wears a Hello Kitty t-shirt with her long floral skirt. This makes me smile. 21st century Candomble. Step forward, step back, arms swaying. Turn and repeat. Hips and elbows swaying to and fro to the rhythm. Ankle length skirts, like 18C Bronte sisters meets Tropicalia. A shimmying wave, pulse of floral prints with ribbon trim at the bottom. A man arrives wearing a cool cream crochet beret, French style, beatnik. He’s also wearing a white and silver embroidered tunic, white trousers and matching white brogue slip-ons. Such a dandy!! He about 60 years old. As he bellows out a song with everyone else I notice his two front teeth are missing which only adds to his charm. The Dandy is full of humour and play. Calling out to specific women who smile and sing back a response. Several sequences are danced and sung out, calling up the Spirits of the Dead. 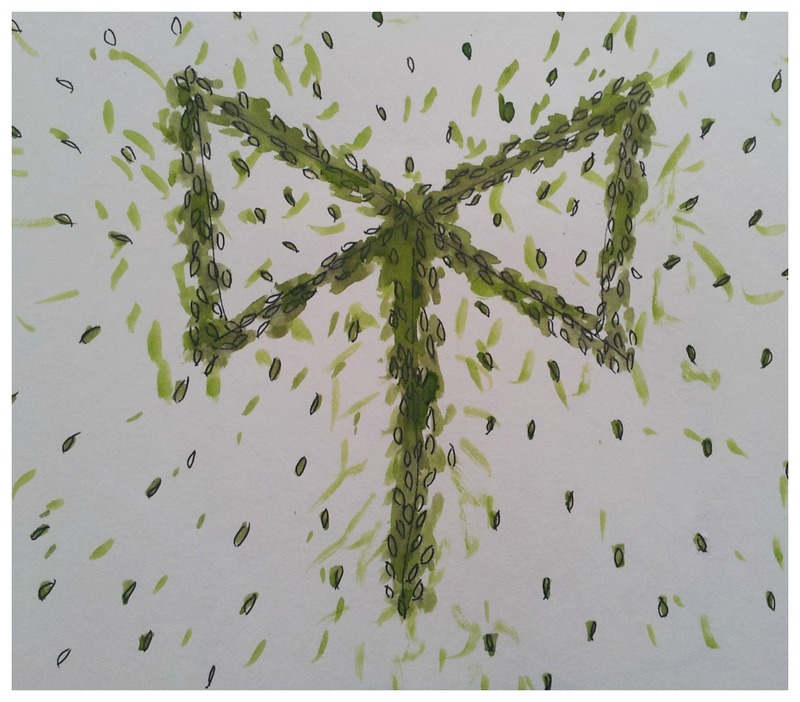 …Different rhythms, different songs….. Part One comes to a close as the women convoy down the hall in a grand finale free flowing dancing queue and then back up to circle around the axe leaf altar. Small Orixa statues in the corner? A candle is lit to acknowledge them. I look later to discover that they are Catholic saints. It’s midnight when Part Two begins…..
A group of men take up long bamboo canes and take their turn to circle the leaf Axe. They bob up and down, singing and calling, striking their canes to the floor to keep the Spirits of the Dead at bay. A goat is brought to the centre of the circle from a side room. She wears a white and red cloth across her back, covered in axe symbols. …..A sacrifice? I feel sick and wish I hadn’t eaten the pre-ceremony welcome of coffee and salgados. Questions, struggles rise up in my mind regarding my own beliefs, morals and being predominantly vegetarian other than occasional fish, my comfort zones, …how open minded am I really…..?!! Beyond the Axe centrepiece woven mats are lay out and a feast to honour the Orixa is set: three massive clay dishes of offal and chicken feet, live birds – the rooster, a dove…. More vessels of food and drink that I can’t discern…. The men pick up a vessel each or flapping bird and carry as they continue to circle the Axe. Everyone singing now, calling, clapping. I glance a very old lady singing her heart out, she has a toothy grin. Her frame is tiny, she is in full white lace regalia. Another vision of beauty to me. Lights flicker. Hanging bulbs. Film noir. Place of worship, a long cool humble interior, corregated roof = The village halls I know from tea dances in rural Norfolk. 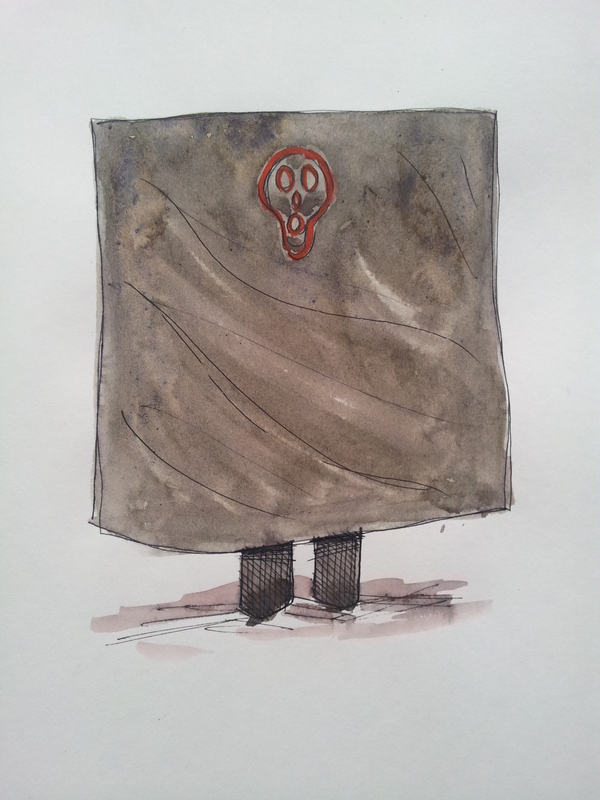 Literally a walking blanket of dark grey with a skull embroidered in red at the natural height of a face. The figure swaggers and sways in a dance. A spooky swaying square. The theatrical effect is incredible! The feet are covered by trousers that hang to the floor. Again: simple illusion so this figure looks even more other wordly. Our human protectors huddle together and crack their canes towards the ‘spirit’ as if defending themselves from a predatory animal. A second figure comes into the room – a beautiful Darlik. Is this Egun ,the Orixa who communes with the Dead? He is clothed in a wonderful decorative garment: head dress, face covered with a fringe of swinging beads, long cloak of ties & godets – contrasting fabric, the outer of mirrored shapes and seashells reminding me of a Rajastani textile. He swings and sways and grunts in a low non-threatening voice ….like Yoda! a vaguely human sound. His costume carries with it a symbol. As the Orixa approaches us, the audience, the men rabble around and use their canes to maintain a safe distance. One or two women sat next to Eun Jung and I whisper, and remind us not to risk looking up at him with a direct gaze! It’s so hard not to gaze directly at something you find beautiful. Like a dancing Christmas tree. This is a marvelling mixture of theatre, threat and the awe of discovering a new species or alien. The dancing, twirling, convulsions continue. This bird of paradise is in full movement, momentum and MAGIC are the result. When Egun finally leaves the room the session pauses to break. I’m tired and bewitched. It’s 2a.m. WOW! WOW! WOW!!! This – is – AMAZING!! We eat a tasy supper of rice and vegetables. Everyone else, with chicken. The people here are warm and hospitable. Cecile, Cristina and I talk over our impressions, our inspiration. Cecile tells me about Pierre Verger and Roger Bastide. Two French authors and anthropologist experts of Candomble. Clockwise from Top L: Pierre Verger, 1952 / His photograph of Candomble priestess / Roger Bastide / One of several books he wrote about Afro-Brasilian culture. The bamboo canes cast shadows against the wall. Row of 13 chairs, each unique and regal in appearance. They are covered in folkloric detail. A long winding serpent, plants, flowers and symbols carved into their wooden surface. Some have metal detail, other upholstered with pretty textile. Most are old and very rustic, humble. They are magical. I wander outside, against the advice given: now dead have been called up it’s unsafe to venture beyond the blessed retreat of the hall. The night air is quite something. Inside it’s humid and heavy, outside is fresh and calm. Tall silhouetted palm trees and cicadas. A huge glowing fire, embers floating up to the sky, crackles. A huge tree stands by the fire and entrance to Ile Aye, like a Tree of Knowledge. The same red & white bunting from inside spans large areas outside, tied from tree to tree around the hall. As if the colourful orb is spider webbing out from that magical axe of leaves inside, a aura, a configuration on the earth big enough to be seen from space by spirits floating by. I think of the Nasca lines in Peru. I imagine the colour, the channelled energy of the people, the ‘magic’ of this sacred interior extending and belting out rays of energy. High up on my list of places to visit are The Nazca Lines in Peru. 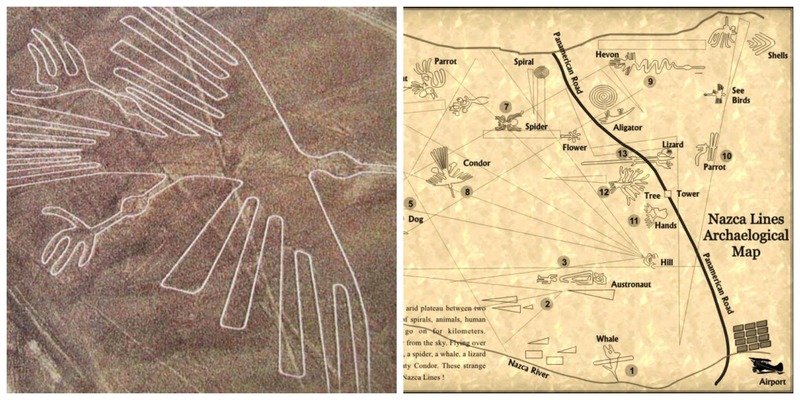 This mysterious pattern of desert geoglyphs can only be appreciated from an aircraft and are dated at over 2000 years old. A spiderweb constellation of bunting spanning out from the Ile Aye. I find an amazing place to live on Morrão Sereia. 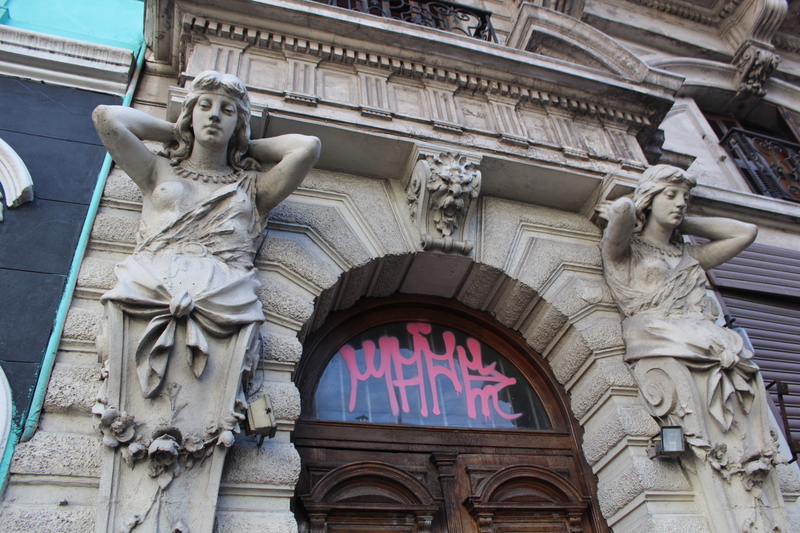 This name means ‘Mermaid Hill’ and Yemanja graffiti is everywhere. 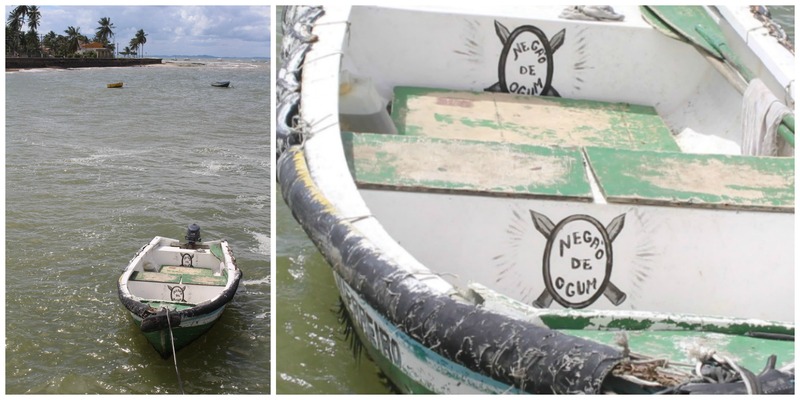 She’s the Orixa of the sea and the protector of fishermen. 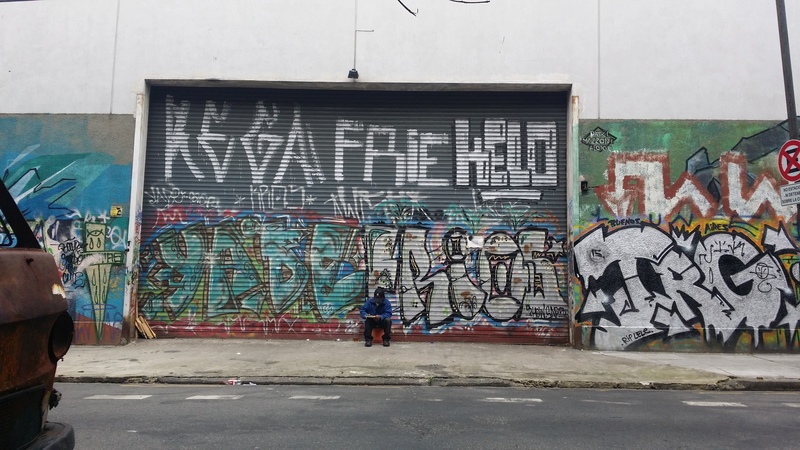 In fact, as an extremely old port, Yemanja’s name and image is woven into the very mindset of Salvador…..in shop signage, advertising, hotel names, street names. Yemanja on the side of a hotel in Rio Vermelho and more mosaic in the Morrao. A series of serendipitous events lead me to meet Suzy who has a spare room to rent. I’m taken to a magical place right on the seashore where the waves crash right below the concrete patio. Her house is like a brightly coloured cave. Bare concrete walls decorated with mosaic murals. Gorgeous young cachorros / dogs that would greet and follow like affectionate children. This little troupe would sleep outside our door, on the window ledges, by the gate. Lots of wagging tails. Life on the Morrao is unique. A labyrinth of alleys and tumbledown dwellings; windows and doorways at all different levels, narrow winding steps. These former fishermens’ cottages are part of an urban enclave completely disguised from the main road, like a tropical Narnia; a combination of favela, termite hill and jewel with mosaic, decorative tile and coloured glass here and there. Two chatty women passing the time of day o my regular cell phone ‘credito e coisas’ errand. Young lads playing dominoes in the L’Argo do Morrao/ the Square. I joke one evening expressing my pleasure at discovering the doorway to this camouflaged world. 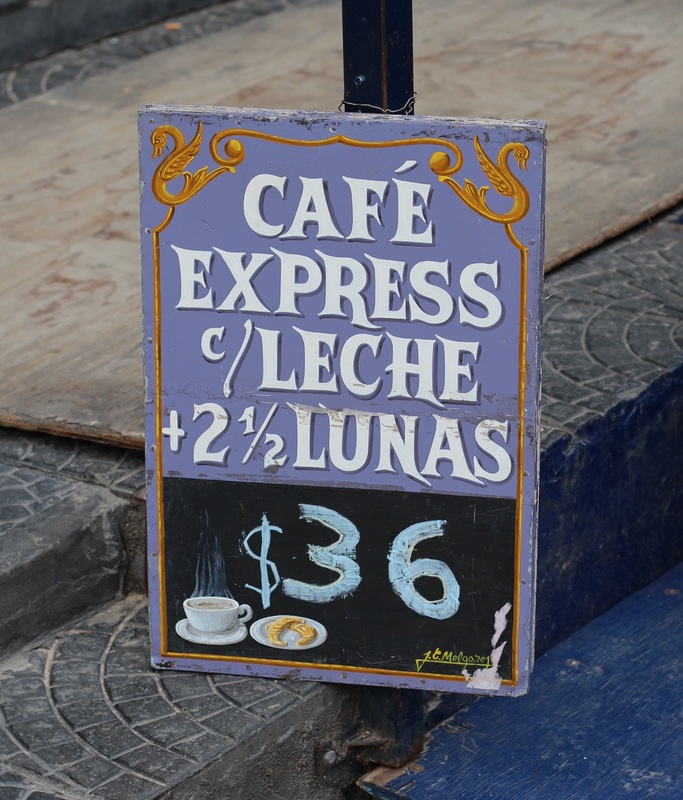 Salvador is an intense city and this place provides some much needed respite. Suzy goes on to tell me about the Quilombos: fugitive slaves who formed a secret community here centuries before and in other secluded places like the Morrão. One evening I am invited to take part in an Ayahuasca ceremony. I’ve heard much about this hallucinogenic brew or ‘plant medicine’ and I’m really curious. I don’t intend to ‘imbibe’ but the invitation still stands and I join eight others at a nearby hovel, beautifully cosy inside. Etiquette is shared and the ritual begins. Our host addresses us with words of devotion of the medicine that will take each of us on a personal journey to commune with the spirits of nature herself. He pours a measure per person and we take it in turn to enter the circle and drink – in my case, a half measure. Members of our circle play drums, flute, tambourine. They are amazing accomplished local musicians. We all sing ‘hinarios’ from a little hymn book of Santo Daime songs. This is a relaxing colourful and charming place to be. The lyrics leap off the page. They are bursting with beauty and describe with humility an adoration of the natural world. The language is simple and overall easy to understand; I feel a surge of inspiration and make discreet notes. After another measure of the sacred brew I only feel content and relaxed, no strong affects. 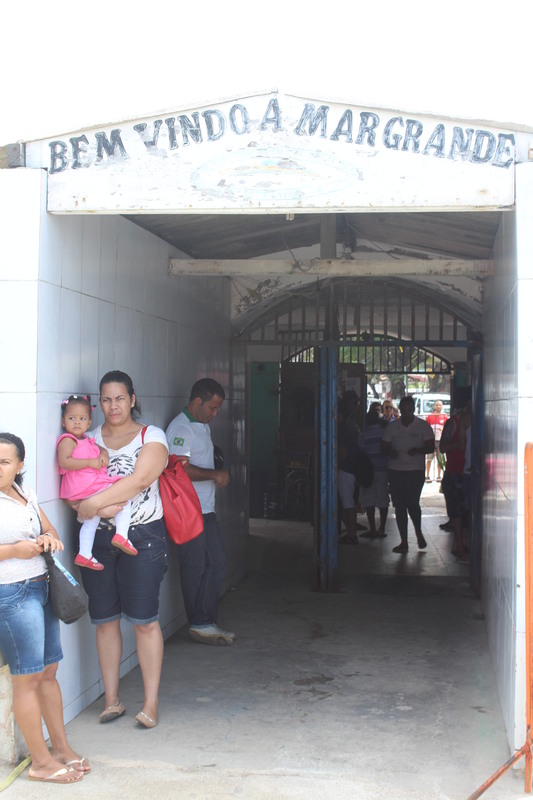 Others are ‘flying’ interspersed with visits to the banheiro to purge. Santo Daime is a religion founded in the 1930s by Mestre Raimundo Irineu Serra, the son of former slaves. It was during work on rubber plantation that he came into contact with people who taught him how to use Ayahuasca. In these early experiences he encountered the Virgin Mary (the Queen of the Forest) and began receiving spiritual guidance which developed into organised worship Santo Daime. What evolved was a fascinating amalgamation of religious and spiritual threads: a Christian core is combined with other elements, such as an emphasis on self awareness and personal development, an Animist appreciation of nature, such as the Sun, Moon and Stars, as well as the totemic symbol of the ‘beija flor’, the hummingbird. 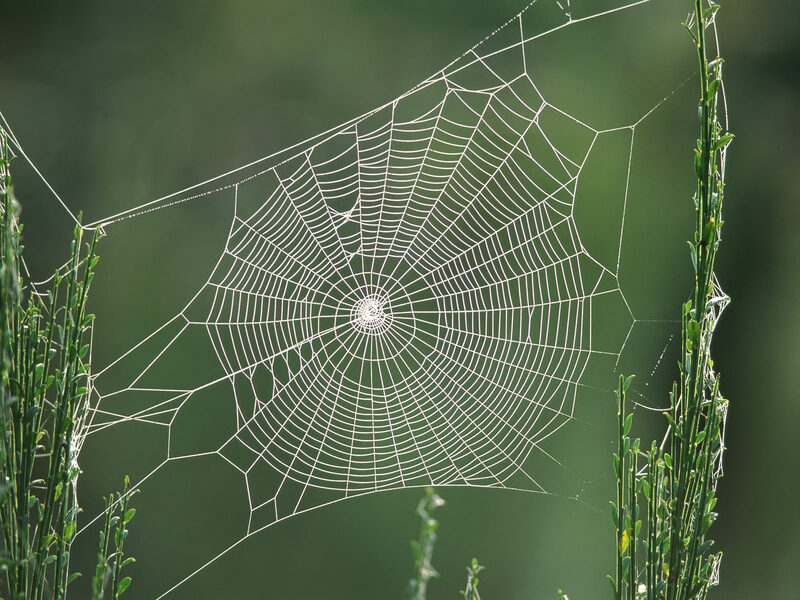 Links with Shamanism can also be made. ‘Must Grow!’ My own words on spending time in the wilderness near Itacare.